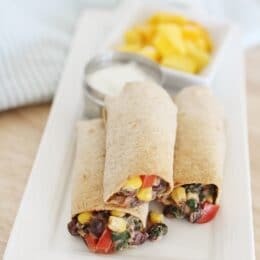 With black beans, spinach, corn, and peppers, these quick and easy Taquitos are packed with nutrients! 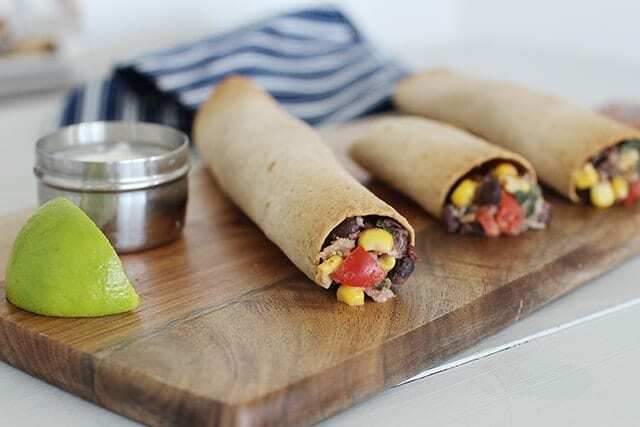 Our first vegetarian taquito recipe was a huge success with my kids! They love this dinner because it just tastes good. 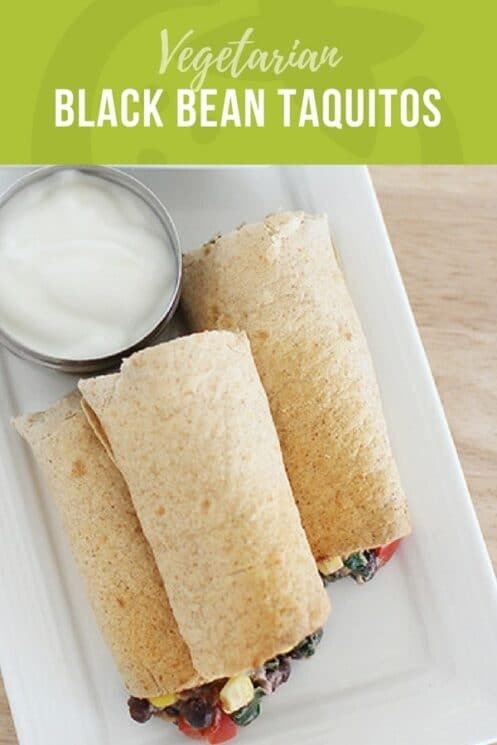 I love taquitos because they are quick and easy to make, and they are portable for those busy nights when you are on the go. Sometimes, I’ll add some pre-cooked chicken or ground beef, but it’s not necessary for my kids to eat it up and feel just as satisfied. Black Beans– Black beans are a great source of fiber and protein. Garlic- An excellent source of manganese, vitamin B6, vitamin C and copper. Also a good source of selenium, phosphorus, vitamin B1, and calcium. Spinach- We like spinach as a source of Vitamin A, K, C, Folic acid and iron. Bell Peppers – We use bell peppers a lot (check out this list of snack ideas with bell peppers),but their rich color makes them an excellent source of antioxidants! Corn – Corn doesn’t always get noticed for how healthy it is, but it’s an EXCELLENT source of fiber, which kids need! These taquitos are also baked rather than fried. 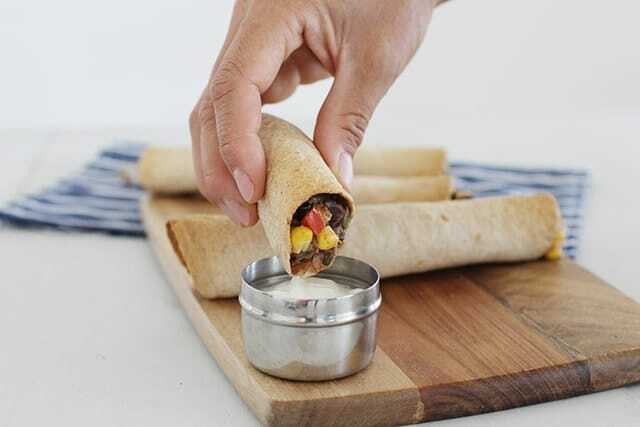 We do have a new taquito coming out in a few weeks where we used an air fryer, but since those are so new, and not a lot of people have them, we went the traditional method of baking in the oven until the tortilla got nice and crispy. 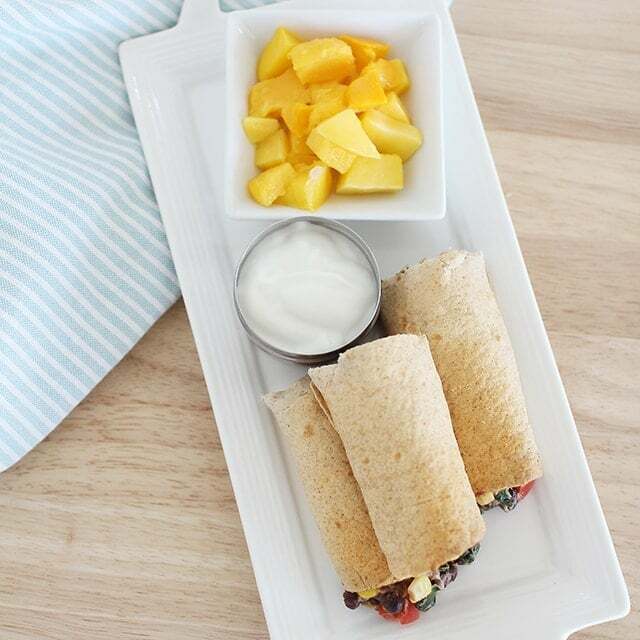 Once cooked, you can wrap these in wax paper, freezer paper, or foil. Like we’ve done with our breakfast burritos, we’ve wrapped and stored these to eat another day! To freeze: Before baking the taquitos, place on a baking sheet and flash freeze. Once mostly frozen, transfer to a ziploc bag and freeze for up to 3 months. When ready to serve, follow the baking steps on the recipe and increase cooking time by 5-10 minutes or until heated through. Place 3/4 cup of the beans in a food processor with salsa, garlic, cumin, salt, pepper, cream cheese and lime juice. Process until mostly smooth. Thaw and drain spinach. Dice bell peppers. Transfer the mixture to a medium bowl and add spinach, bell pepper, corn, grated cheese, and the rest of the beans. Mix thoroughly. Place about 1/2 cup of the bean mixture on each tortilla. Roll up tightly; place on a greased baking sheet and spray with nonstick cooking spray. Bake in preheated oven for 20-25 minutes or until edges are golden brown and crisp. Can you use fresh spinach instead of thawed frozen?